How Much Should Investors Pay for Spotify? Spotify (SPOT) will begin trading publicly on April 3, but it will not have an IPO. The Swedish streaming service instead plans to do a direct listing of its stock. Employees and investors will be able to sell shares on public markets, but the company itself will not be raising any new capital. The lack of a traditional IPO process makes it much harder to predict where shares will trade initially. It doesn’t help that shares changed hands at prices ranging from $37.50 to $125 in 2017, according to Spotify’s F-1. 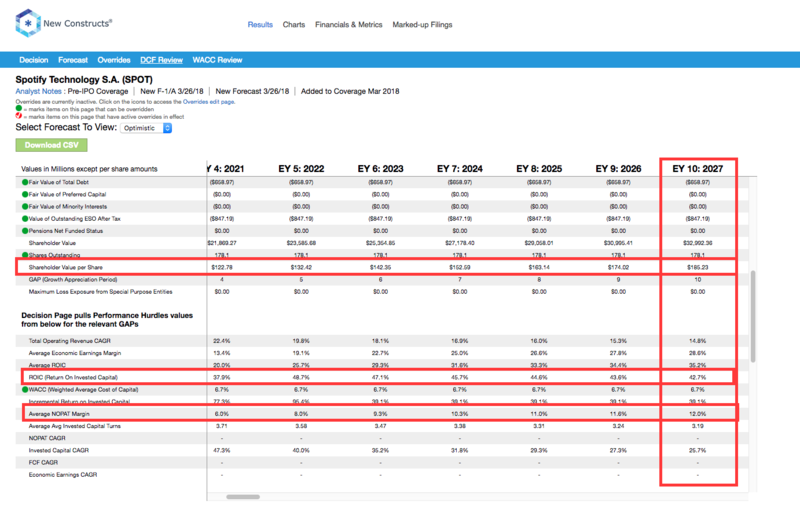 To help investors sort through the confusion, we will present three different proposed valuations for Spotify based on three different scenarios of growth and profitability. We will also explain the strategic challenges the company faces that make the pessimistic scenarios more likely and make the stock this week’s Danger Zone pick. The biggest challenge Spotify faces is simple. It doesn’t own the music that consumers listen to on its platform. Instead, it licenses the music from major record labels. The “Big 3” record labels—Universal Music, Sony Music, and Warner Music—along with Merlin, which represents a large number of independent artists, accounted for more than 85% of all streams in 2017. The oligopolistic nature of the music business gives the record labels a significant amount of leverage in negotiations with Spotify. All the major labels have “most favored nations” provisions in their contracts, which means Spotify cannot give more favorable terms to one label without extending those same terms to all the others. In essence, Spotify has to negotiate with the major labels as a unified block. As Figure 1 shows, Spotify managed to negotiate better rates with the labels in 2017, which helped its gross margins improve from 14% to 21%. However, that increase comes with a significant caveat. The major labels all have significant equity positions in Spotify, and they had an incentive to help the company go public faster in order to avoid triggering clauses in its convertible debt that would have diluted their equity. The labels won’t have this same incentive to grant more favorable terms when terms are renegotiated in 2019. Spotify has targeted long-term gross margins of 30-35%, but the company may find it difficult to achieve that level of profitability as long as it has to negotiate against a highly-consolidated group of content owners. We expect that the content owners will always aim to maximize their profits on the content. Accordingly, anytime they see Spotify as making too much money, they will raise their prices and compress Spotify’s margins. Increased competition from other streaming services, especially Apple Music (AAPL), should also decrease Spotify’s leverage in the future. Although Spotify remains the largest player in the global streaming music market, its competitors are catching up. A recent report in The Wall Street Journal found that Apple Music has been growing paid subscribers at a monthly rate of 5% versus just 2% for Spotify. At current growth rates, Apple Music will overtake Spotify in terms of paying U.S. subscribers sometime this summer, even as Spotify still has nearly double the number of paying users globally. Apple Music is the most notable competitor, but Spotify also faces pressure from Amazon Music (AMZN), Google Play Music and YouTube Music (GOOGL), and Pandora (P). If Spotify ever gets too aggressive in its negotiations with record labels, the content owners can always threaten to walk away and just let consumers access their music through these other services. In addition, Apple, Google, and Amazon can all afford to treat their streaming services as loss leaders to draw users into their platforms. As long as customers buy more HomePods and iPhones, Apple doesn’t care if it makes money on the streaming service itself. As a result, these competitors can easily absorb less favorable terms than Spotify, which eventually needs to earn a profit. Increased competition has also forced Spotify to lower its prices for consumers. The company’s average revenue per user has declined from €6.84 in 2015 to €5.32 in 2017 as it promotes its “Family Plan” that allows several users to share one account. The lower price helps Spotify retain users but puts more pressure on its margins. Given that all the major streaming services have fairly comprehensive libraries, the only way Spotify can build a competitive advantage is through music curation and discovery. The company has made a big push to build hyper-specific playlists in order to differentiate itself from the competition, but it remains to be seen if this feature can be a true difference maker. Even if Spotify can achieve its gross margin goals without losing more ground to its competitors, the company’s rising operating costs make profitability difficult. As Figure 2 shows, research and development, sales and marketing, and general and administrative costs have all grown faster than revenue over the past two years. Figure 2 actually understates the issue for Spotify, as general and administrative expense was artificially decreased by a €12 million reversal of its provision for doubtful accounts. When we account for non-operating items, general and administrative expense actually increased by 55% in 2017 rather than the reported 51%. These numbers make a path to profitability seem especially difficult for Spotify, as it will need to reign in operating expenses as well as improve gross margins. The issues presented above are understood by many participants in the market, which is why the bull case for Spotify often revolves around the company’s ability to become the “Netflix of Music.” Just like Netflix (NFLX) has invested heavily in original content, Spotify bulls see potential for the company to thrive by owning its own music rights, in essence becoming a label itself. We see two big problems with this plan. First, developing original content is expensive. Netflix spends an extraordinary amount of money on original content to attract new users. It also pays significantly more than traditional media companies to attract new employees. Those high costs are an unavoidable part of trying to break into a consolidated industry, and they’ve kept Netflix’s margins fairly low. If Spotify wanted to take on the labels in this fashion, it would need to raise a significant amount of capital. Instead, the company has gone out of its way to go public in a manner that does not raise any money. We can’t know what Spotify executives are thinking, but they certainly don’t seem to be making a push to own their content. It’s probably a good thing for Spotify that they’re taking this path. While Netflix’s push into original content has been challenging, it might be all but impossible for Spotify, simply because a successful music streaming service needs to be nearly universal. Streaming video users may be willing to subscribe to multiple services, but most music listeners want their music all in one place so they can create customized playlists and switch between songs at any time. Netflix’s push into original content caused Disney (DIS) to pull its movies from the service. What would happen to Spotify if, say, Universal Music pulled all its artists? How viable is a service without current stars like Katy Perry and Kanye West or classic artists like Johnny Cash and Queen? Spotify knows that if it makes a serious move to compete with the record labels they can cripple its business in a stroke. Both industries get ~85% of their content from a small group of content providers (the “Big 3” labels plus Merlin for streaming, the “Big 6” studios for movie theaters. Both industries pass along the majority of their revenues directly to the content owners. Both industries make little-to-no profit from a large percentage of their customers and rely on “up-selling” a smaller group of customers (premium subscribers for streaming, concessions buyers at movie theaters). The similarities are striking, and they suggest that the profit potential for Spotify is limited. Looking at the three movie theater companies for which we have data—Regal Entertainment and Cinemark Holdings (CNK)—neither has earned a return on invested capital (ROIC) above 8% at any point in its history. It’s hard to earn significant profits just by distributing other people’s content. Additionally, it’s hard to build a sustainable moat through the distribution of content, especially when the means of distribution constantly change. Movie theaters have seen their business model disrupted by on-demand services, and Spotify could see its model similarly disrupted in the future. Over the past few decades, the primary method of listening to music has gone from vinyl records, to cassette tapes, to CDs, to MP3s, and now to streaming music. It’s hard to predict what will come next, but it’s naïve to assume that streaming music will be the end of this evolutionary chain. To be fair, there are significant differences between the movie theater business and the streaming music industry. Streaming services require much less capital than a movie theater. On the other hand, the recorded music industry is also much smaller than the movie industry. Global recorded music revenue totaled ~$16 billion in 2016, while movie revenues were more than double that at $39 billion. Spotify may be able to achieve a higher level of profitability than movie theaters, but its scale is limited by the relatively small size of its industry. Like Dropbox (DBX) and Snapchat (SNAP) before it, Spotify plans to go public with a dual-class share structure that will leave its founders with total control over the company. Investors get no say over executive compensation practices, acquisitions, or any other major strategic initiatives that normally fall to shareholder votes. Spotify’s reluctance to give outside investors a say in the company also raises questions about its decision to pursue a direct listing rather than an IPO. The company claims to be cutting out the bankers, but it still plans to pay $30 million in advisory fees to several investment banks to manage the deal, so it’s not clear that there’s an economic advantage. Instead, the goal of this direct listing seems to be minimizing dilution for the founders of the company. They avoid triggering dilutive clauses in the convertible bonds and give employees and investors liquidity without having to dilute their own stakes. Spotify’s founders seem more interested in retaining their control and stake in the company than in maximizing the long-term value of the business. Spotify’s corporate structure hurts one of the big bull cases for the stock, which is an acquisition from a larger company that would fold its service into a comprehensive ecosystem. Spotify’s founders clearly don’t want to give up control of the company, and with its dual-class structure they can veto any acquisition offer. Even though the company failed to hit the third target, the board decided to award Ek the full bonus anyway. Investors may not like a company rewarding its executives for missing their targets, but they won’t have any say when it comes to Spotify. The Movie Theater Scenario: Competition in the streaming business remains fierce and Spotify scrapes by with minimal margins and slowing growth. The Consolidation Scenario: Spotify manages to dominate the music streaming market but still has its margins constrained by the power of the major labels. The Ownership Scenario: Spotify becomes a label itself and owns its content, enabling it to earn outsized margins. Due to all the concerns discussed in this article, we believe the first two scenarios are more likely, and they show that Spotify is probably not worth the $19 billion ($107/share) it has reportedly been valued at over the past few months. Combined, these two items equal $1.5 billion, about 8% of the rumored $19 billion market cap. This scenario assumes that Apple Music and other services continue to grow rapidly and challenge Spotify. As a result, Spotify grows slower than expected and struggles to earn significant economic profit as the content owners have all the leverage in the relationship. If Spotify grows revenue by 10% compounded annually over the next decade and earns an ROIC just under 10%, it’s worth ~$14/share today, an 87% downside from the rumored opening price of $107/share. For comparison, Spotify’s current ROIC is -79%. It’s revenue growth slowed from 52% in 2016 to 39% last year, and the company projects slower growth of 20-30% in 2018 with further deceleration expected over time. Assuming its customer pricing model does not change, Spotify would have 158 million paying users if this scenario came true. In this scenario, we assume Spotify emerges as the clear winner among the various streaming services. The company grows revenue at a rate of 15% compounded annually for the next decade. In this scenario, Spotify’s revenue of $19.4 billion in year 10 of the model, or 2028, is 24% higher than the entire recorded music industry in 2016, so we’re predicting that it controls most of the music industry and the industry grows significantly. In this scenario, Spotify’s margins would still be constrained by the content owners, but its scale would give it more leverage. We assume Spotify can earn NOPAT margins of 8%, just slightly below the median of the 67 media companies we cover. Due to its relatively light capital requirements, it would earn an ROIC of 21%. In this scenario, SPOT is worth $78/share today, 27% below the rumored opening price. Assuming its customer pricing model does not change, Spotify would have 246 million paying users if this scenario came true. If the ratio of paid to free users stays the same, the company would have 545 million total users. In this scenario, Spotify successfully pushes out the record labels and takes ownership of all its content. Its revenue and user growth over the next decade are the same as the consolidation scenario, but it now has the ability to earn a long-term NOPAT margin of 16%, on par with a successful content creator like Disney (DIS). In this scenario, SPOT earns an ROIC of 43%, which would put it in the top 3% of all S&P 500 companies, and is worth $185/share today, 74% above the current stock price. Investors need to believe in this wildly optimistic scenario to buy into SPOT. Notably, even this bullish scenario does not reach the $200 and $220 price targets already put out by sell-side analysts. As with Snapchat and other highly touted IPOs, investors should be wary of sell-side price targets based on dubious math. Longer term, Spotify will need to renegotiate its licensing agreements in 2019, and an unfavorable outcome then would be a significant negative for the stock. Income Statement: we made $2 billion of adjustments with a net effect of removing $447 million in non-operating expense (9% of revenue). We removed $782 million related to non-operating income and $1.2 billion related to non-operating expenses. 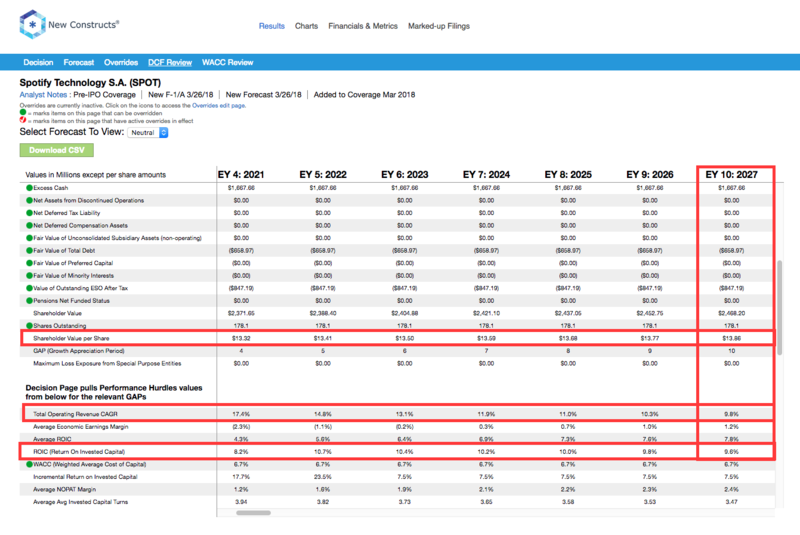 See all the adjustments made to SPOT’s income statement here. 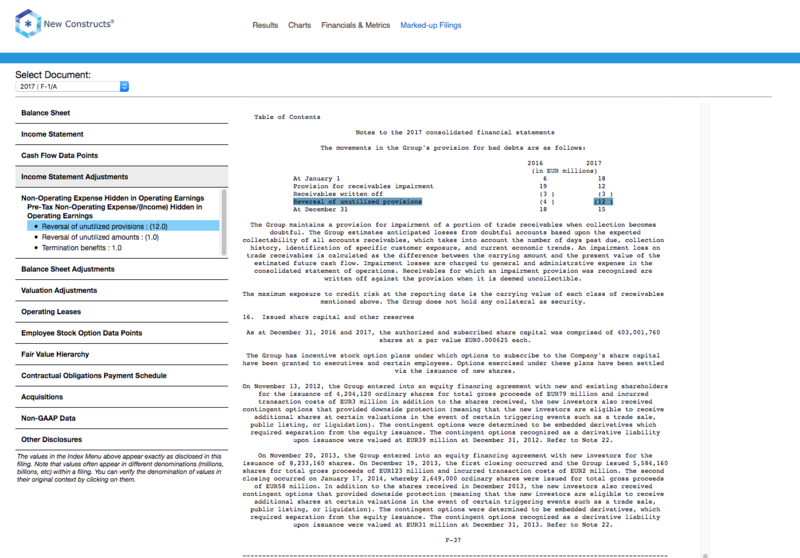 Balance Sheet: we made $2.8 billion of adjustments to calculate invested capital with a net decrease of $752 million. The most notable adjustment was $1.7 billion (112% of reported net assets) in excess cash. 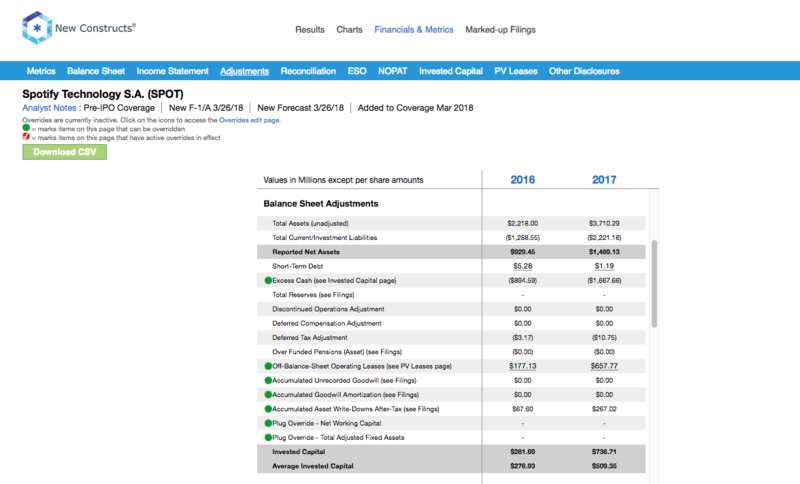 See all adjustments to SPOT’s balance sheet here. Valuation: we made $3.2 billion of adjustments with a net effect of increasing shareholder value by $162 million. The excess cash was mostly offset by the off-balance sheet debt and the employee stock option liability referenced above. This article originally published on April 2, 2018. Disclosure: David Trainer, Sam McBride, and Kyle Guske II receive no compensation to write about any specific stock, style, or theme. 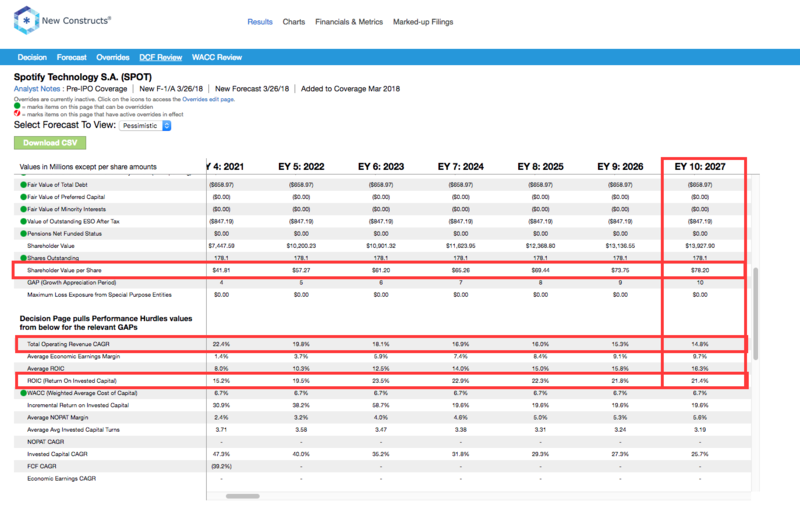 Research shows that ROIC is the primary driver of valuation. Ernst & Young’s recent white paper “Getting ROIC Right” proves the superiority of our holdings research and analytics. 1 Response to "How Much Should Investors Pay for Spotify?" Spotify opens trading at $165.90/share. It appears the market has bought into the most optimistic scenario for now.